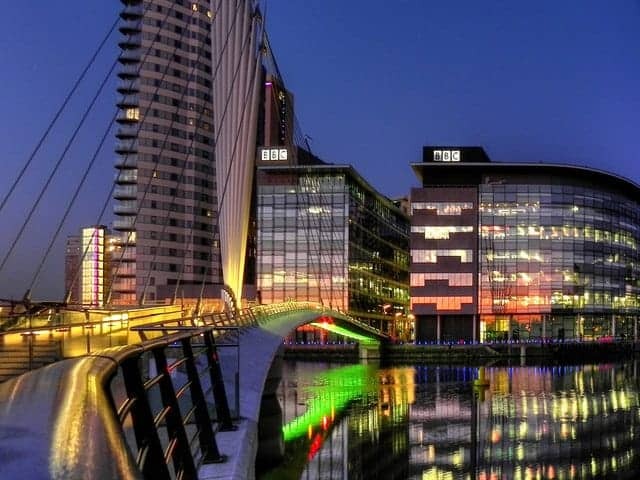 Salford Council have brought a in Public Space Protection Order to cover the Salford Quays area hoping to curb anti-social behaviour. If anyone uses “foul and abusive language,” it will deemed a criminal offence due to the workings of the order. However, it does not stipulate what words are “foul and abusive.” If anyone is nabbed doing it, they will be slapped with an on-the-spot fine. This order will impact on Manchester United fans on their way back from Old Trafford, and they have a lot to swear about at the moment, due to their lacklustre results. Political activist and comedian Mark Thomas who is performing at the Lowry arts centre located in the zone has put together curse words he is going to use, which he will forward to the council to see if they breach the order, we are pretty sure they will. Salford council have reacted to the negative publicity and said they are only attempting to help Salford residents whose lives are being constantly harassed by anti-social behaviour. Liberty’s Legal Officer Ms Brighouse said: “This is a staggering example of the misuse of a Public Space Protection Order – so vaguely worded it’s impossible for anybody to know whether they’re in danger of breaking the law. “The right to say what we want should not be restricted at the whim of council officials, able to issue fixed penalty notices on the basis of a poorly defined legal order. Without the freedom to offend, real freedom of expression cannot exist. Salford City Council said: “We will discuss Liberty’s concerns privately with them and make sure nothing interferes with Mr Thomas’s artistic performance. “Liberty are fully aware that breach of a PSPO is only an offence if a person does a prohibited act without a reasonable excuse. That allows all the circumstances to be taken into account.